Welcome trick-or-treaters and party guests with these clever Halloween door decorations that will set a spooky—or maybe silly—mood. Most of these projects are pretty easy to make, perfect to get the whole family involved. From a simple spider web to a fun Frankenstein, these door decor designs are sure to be boo-tiful! Monica of East Coast Creative used fabric strips to turn her front door into an adorable mummy. This mummy door is just one element of her amazing front porch Halloween design. Take a look at all of her creative ideas, including some Halloween pallet decor and an adorable "mummy loves you" sign. Who knew something as simple as bats cut out of poster board could have such a dramatic effect on an entryway? Apparently, Linda from It All Started With Paint did, because she created this spooky, flying bats design to decorate her porch for Halloween. Visitors are sure to be spooked, yet charmed, by this creepy and clever decorating idea. It's amazing how sometimes simple items like tape and paper are all you need to create a big impact. 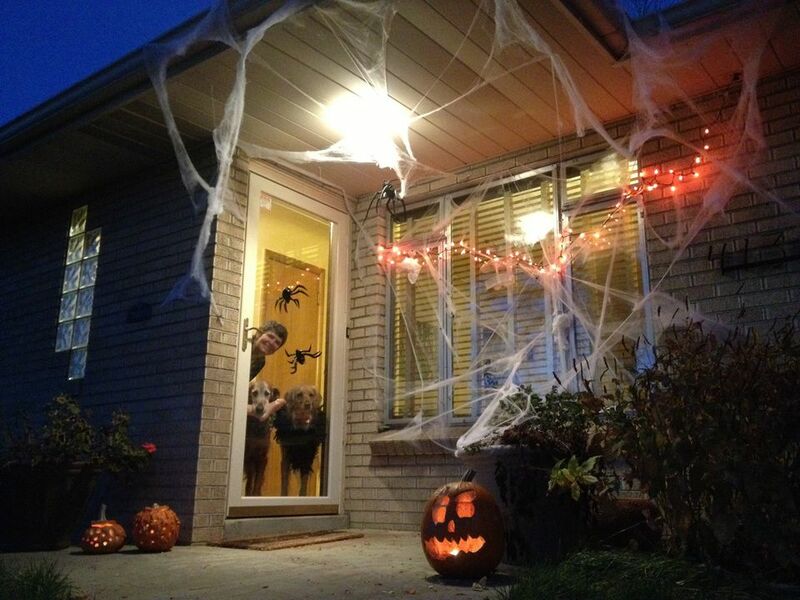 And that's exactly what Rachel of The Kids Activities Blog did when she designed this spider web with eyes door with her children to celebrate Halloween. And don't stress about it—the spider web doesn't have to be perfectly symmetrical. Let the kids create their own design! When Halloween party guests or trick-or-treaters show up to this front door, they might get the feeling they're being watched—by several sets of spooky eyes! This easy Halloween decorating project comes from Linda at Craftaholics Anonymous. By placing reusable sticky pads on the door you don't have to worry about having trouble removing the eyes when Halloween is over. What a great idea to decorate a dead tree for Halloween! Rita from Pink Polka Dot Creations did just that when she painted and potted one, and then hung Halloween decorations from the branches. The Halloween tree is fabulous on its own, but Rita didn't stop there. She also hung a large, decorative witch boot on the front door, and tied it all together with a witch hat at the base of the tree and some adorable pumpkin-witch string lights. Perhaps this Halloween tree and Witch boot design will inspire your own front porch decor this year! When it comes to Halloween, Heather of Twin Dragonfly Designs says " I love dressing up our home and being a little bit silly." And that's why she created this Jack Skellington front door to greet friends and neighbors at Halloween. Want to make a Jack Skellington door at your house? Heather shares not only her design but also a tutorial with free, printable templates to help you do just that. Skaie Knox of Home Jelly shares how to make a paper bag door monster out of recycled grocery bags. What a fun DIY project to have the kids help make—just cut, tape, add the paper plate eyes and paper teeth, and it's ready to hang!